Here is just the kind of disc I welcome most. Excellent performers that I have not encountered before, an interesting choice of music, including works well off the beaten track and those that are more familiar, a good, clear, recording, and helpful notes. To fill out these headings - Meyrick Alexander has been principal bassoon of the Philharmonia Orchestra since 1980. Although he also plays period instruments in other orchestras as far as I am aware does not do so here. Catherine Milledge is a Welsh pianist who has won many prizes as an accompanist. Both players are worth hearing both individually and as a duo. 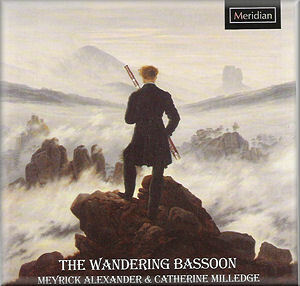 The recording does tend to favour the bassoon but not to excess. The disc opens with the Mozart Sonata. It is usually described as being for bassoon and cello but the version published in that form after the composer’s death is itself an arrangement of a Sonata for bassoon and keyboard that Mozart wrote for Baron Durnitz for whom he had also written the Bassoon Concerto. What we hear on this disc is a very convincing attempt by William Waterhouse to recreate the original work. It is hardly his fault that he cannot make it more interesting musically than it is in its cello form, but it remains a pleasant minor piece worth an occasional hearing. These performers make the best case possible for it with impeccable and stylish phrasing. The piano part of the Concerto by Guy Woolfenden is also a transcription, but in this case it is the composer’s own reduction of the original orchestral version. It sounds convincing in itself and certainly the Concerto, in three succinct movements, is worth hearing in any form. The first movement is almost obsessive in character, the second more an English rhapsody and the last essentially bracing. As the composer points out, there is some debt to Nielsen and Sibelius but it has a character all of its own and it is good to have it recorded, albeit without the original orchestral parts – perhaps this disc will encourage a recording of that version, preferably again with Meyrick Alexander for whom it was written. The Sonata by Gustave Schreck is another novelty, at least to me. The composer was Cantor at the Thomaschor in Leipzig, but the main influence here is Brahms more than Bach. It can hardly claim much originality but it is an essentially companionable work which deserves its place here. The other works are more familiar, the Weber arranged from the viola original by the composer and the Kreisler arranged by Meyrick Alexander. Once again the latter’s delightful tone and phrasing makes the most of all of these pieces. Even if you think that you can do without a bassoon recital disc this well varied and entertaining programme by two excellent musicians should make you think again.